Same mounting holes and overall size as these Merlin Gerin Compact NS breakers (only minor faceplate variations). *Merlin Gerin's part is a 160A (international), US Breaker offers the HG3C150L at 150A or JG3C175L at 175A. **Merlin Gerin's part has an electronic trip unit, US Breaker offers a thermal-magnetic trip unit. Merlin Gerin part numbers are provided to assist product selection. 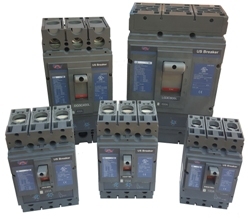 US Breaker represents its own UL listed circuit breakers and is not associated with Schneider Electric. Please verify handle throw, terminal cover & faceplate dimensions where critical. Feel free to call if we can help. US Breaker brand accessories are for use in & UL lised for US Breaker brand MCCB's. Please let us know if we can help cross reference any accessories.